Chappy is a family saga spanning the decades from the 1920s through the second world and into the 1980s – detailing lives, loves and losses. Daniel is a young man feeling out of place and context in the ‘stoniness’ of Europe, although fluent in four languages he feels isolated and one night smashes his car into a wall. His mother sends him back to his ancestral land in New Zealand to sort himself out. The novel is Daniel’s documenting of his family’s history in an attempt to understand who he is and where he came from. The story is told mainly in the words of his Grandmother, Oriwia, and her translations of the words of his ‘twice adopted’ great Uncle Aki. But that is far too clinical a précis of this warm and complex novel. Despite a strong connection to land and place the family are a patchwork and polyglot lot – including at least one member of a different and once enemy tribe, Hawaiian members from Aki’s marriage, Daniel’s Danish father, some Germans who were included when times went hard for them during the war – and Chappy, Oriwia’s Japanese husband. Chappy is adopted into the tribe after Aki and an Indian shipmate bring him to the marae after seaman Aki discovers him as a stowaway on one of his voyages. Whakapapa is important, but what others bring into a family is important too – new skills, new knowledge … and it isn’t surprising that the first skill Chappy brings to the family is bamboo weaving – Chappy is a narrative about how lives are woven out of found materials – be they people, things or circumstances. Or that the last skill he brings is creating a garden of peace – the earth and its produce; animal, vegetable and mineral, are another constant motif. Whakapapa is important – but go back far enough and Aki’s whakapapa, heard while a kid with his ear being held to keep him in place, becomes the same as that of his Hawaiian family – perhaps if you go back far enough all the threads will eventually merge. The refrain: ‘Who is your mountain? Who is your river? Who are your ancestors? What is your name? Who are you?’ becomes a set of questions for us all. 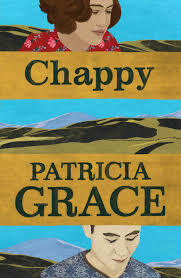 Chappy is a terribly sad novel; the discrimination against Maori, both personal and institutional, is a constant backdrop. And as well as the local German family being rounded up by authorities during the war, after Pearl Harbour Chappy too has to flee. After incarceration Chappy ends up back in Japan – a country he fled in opposition to its militaristic policies – and he feels the need to stay and help build the new Japan – or does he just want to keep his New Zealand family safe? Questions of motive and rationale are throughout the book, and difficult choices have to be made when love and loyalty enter the picture. Yes it is a sad book, but also joyous in the warmth and inclusiveness of the characters. Chappy has passed away by the time Daniel visits, and remains slightly out of focus. But this is not a criticism, is adds depth and texture to the writing; the reader too is trying to interpret this person – and it allows for a wonderfully open ending for both Daniel and Oriwia … A wonderful New Zealand novel!